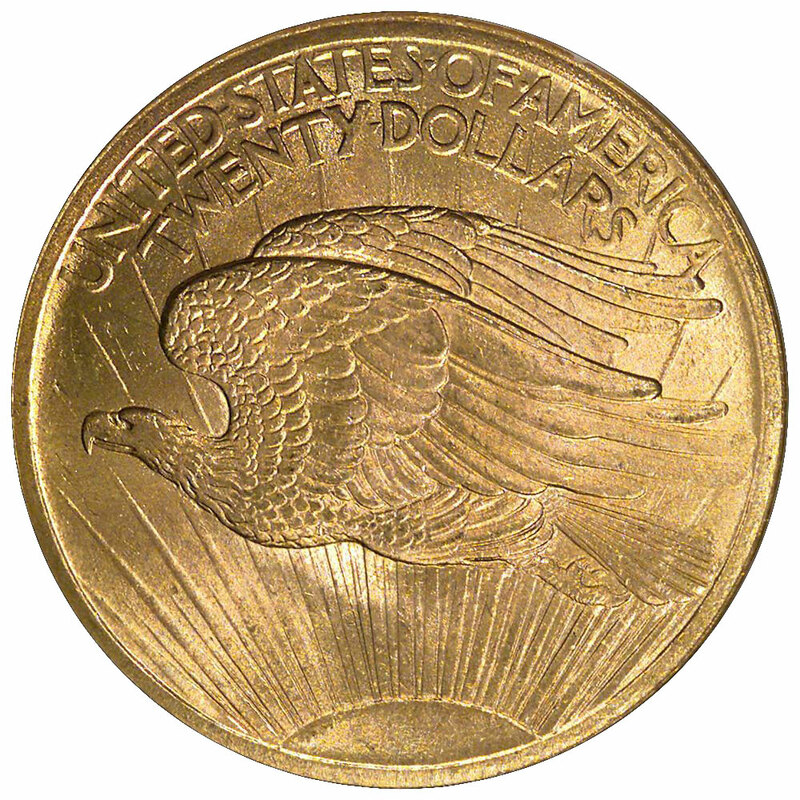 Any survey of the most beautiful United States coin types will almost certainly place Augustus Saint-Gaudens' design for the 1907 double eagle near the top. These impressive $20 pieces appeal to both numismatists and the general public. Fortunately, with the exception of a half dozen or so rare dates, most coins in this series are available over a wide range of mint state grades. 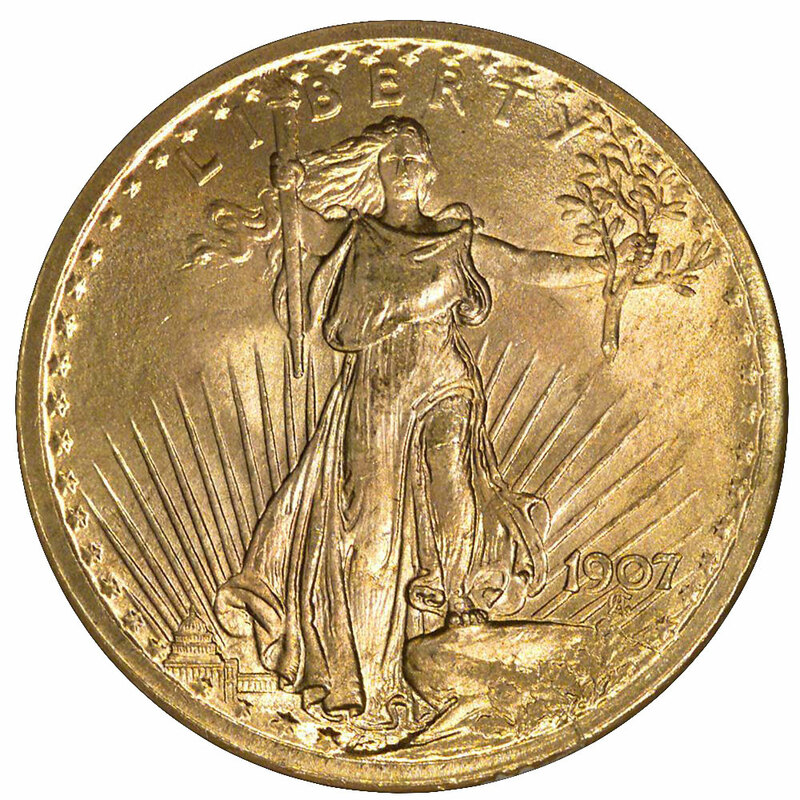 Collecting Saint-Gaudens double eagles by date and mint is an expensive undertaking, and the typical collector will be satisfied with a few examples to serve as type coins. A type collection can include just a single coin, or it can be comprised of one without the motto IN GODWE TRUST (1907-08) and one displaying the addition of the motto (1908-33). The subtype with motto may be further broken down into coins featuring 46 stars around the obverse border (through 1911) and 48 stars (1912 and later), a change reflecting the admission to the Union of New Mexico and Arizona. The high-relief edition dated MCMVII (1907) may be added to these three sub-types. Owning one of these spectacular double eagles is as close as most collectors will come to possessing this coin type as its creator originally intended it to be. The high-relief type is not especially rare, though its popularity makes it relatively expensive. Since these prototypes didn't actually circulate to any extent, most specimens are mint state or only slightly worn from mishandling. In fact, pieces grading less than About Uncirculated (AU) probably were carried as pocket pieces. As there are quite a few examples certified in grades AU-55 through MS-64, you will want to exercise patience in selecting the most eye-appealing specimen your budget permits. Not all coins certified in a particular grade are equal in aesthetic value, and you should examine a number of these high-relief twenties before making a purchase. Among the problems to watch for with this issue are rim bumps and hairlines. Damage to the rims is especially prevalent on high-relief coins, as their sharp rims conspired to make this area quite vulnerable. While such damage is weighed when assigning a coin's certified grade, a problem-free coin is always preferable, whatever the grade. Hairlines are fine scratches imparted by contact cleaning or sliding within envelopes or loose coin holders. They also can result from the moving slides in coin albums, though I believe this cause has been greatly overstated by most numismatic writers. Hairlines may not be evident without a bright light (75 to 100 watts is ideal), so you shouldn't buy a coin when the dealer doesn't have a good incandescent lamp at his shop or bourse table. The low-relief type without IN GOD WE TRUST was coined only during 1907 and the early part of 1908, yet examples are plentiful in all grades. 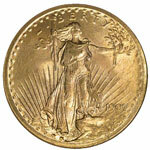 The 1908 Philadelphia issue is especially abundant in mint state grades and makes an appealing type coin. Most coins with the motto also are available in grades up to and including MS-65. Dates such as 1924, 1927 and 1928 are especially common. The early dates (1908-16) have more textured, grainy fields than the later pieces, which typically are very bright and display luster of a finer grain. The form of luster you prefer is a purely personal choice. With so many high-grade coins from which to choose, there's no reason to be careless in selecting your specimen. Things to watch for include the rim bumps and hairlines mentioned (though these are not as prevalent with the low-relief type), as well as heavy contact marks on critical elements of the design or in exposed parts of the fields. Contact marks are more common on the low relief coins, since these were actually bagged and shipped from the mints to various banks and often were moved repeatedly over many decades. Marks on important features, such as the date and mintmark or Liberty's face, weigh more heavily when grading a coin than do marks hidden within the folds of Liberty's gown or the eagle's feathers.